STUDIO SCORECARD. In the worldwide studio rankings for 2013 to date, no change in the studio standings from last week. Reminder: the chart below has been reformatted and expanded to include a look at all releases from each studio, divided into three buckets: worldwide grosses of over $300 million, grosses between $100 million and $299 million, and films under $100 million worldwide. Over the past six weeks, 2013 is now 1% above the same six weeks in 2012 but 5% below the four-year average in the same time frame ($0.920 billion). International box office for 2013 releases through January 5, 2014. Click here for a summary of worldwide performance by studio. 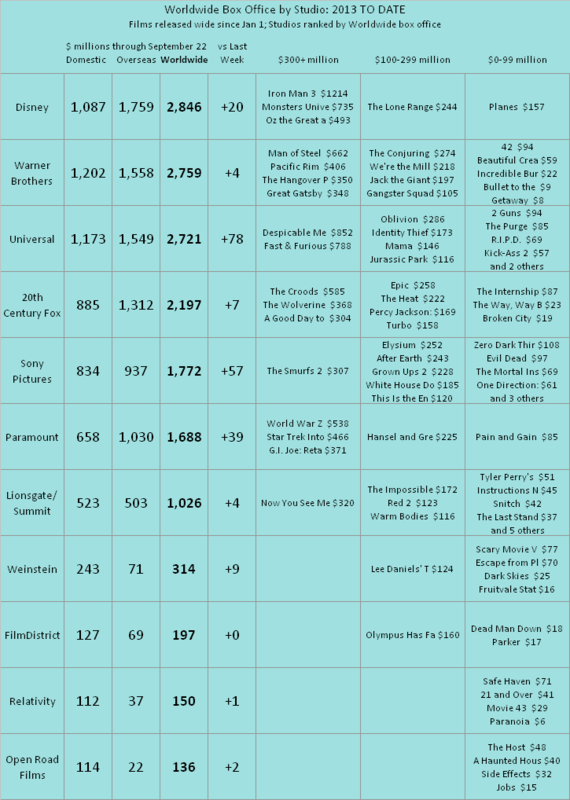 International box office for 2013 releases through January 12, 2014. Click here for a summary of worldwide performance by studio. We will start tracking the 2014 films in a few weeks. International box office for 2013 releases through January 19, 2014. Click here for a summary of worldwide performance by studio. We will start tracking the 2014 films in a few weeks.